Here is some basic information about the two popular e-learning storyboard formats. A PowerPoint storyboard gives a good visual presentation of each frame. It is easy to get a real feel of the final course in PowerPoint. However, it is harder to provide developer instructions in PowerPoint. I overcome this limitation of PowerPoint Storyboards by using detailed tabular columns outside of the main slide area. 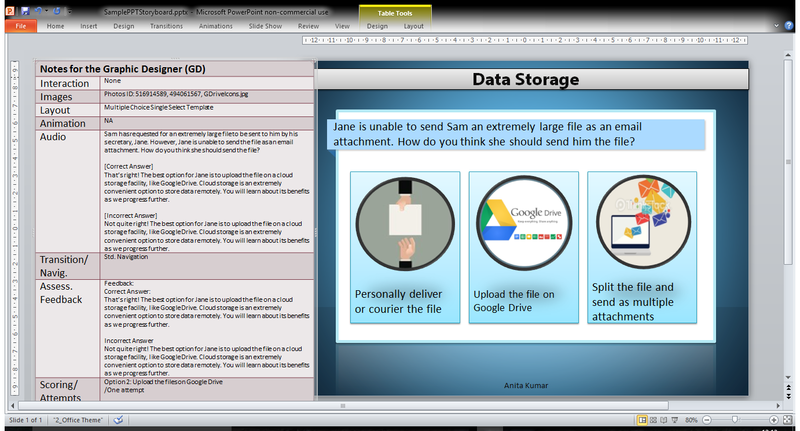 Here’s a screenshot of a storyboard that I developed in PowerPoint. When I need to present a lot of textual content, I prefer to storyboard in Word. The SME and the client find it much easier to review and edit text in Word. Shown below is one of my Word storyboards, which uses a simple three-column format.